(Bloomberg) -- Venezuela’s National Assembly leader Juan Guaido said a special police squad accused of extrajudicial killings visited his home Thursday, days after the authoritarian regime restricted his travel. The force’s commander denied it happened. During a news conference on the opposition’s economic plans, Guaido, who is gathering international support in his bid to unseat President Nicolas Maduro, abruptly announced that the feared Special Action Force had come to his house. The authoritarian regime has left Guaido free to hold meetings and press his case that he is the nation’s rightful leader, though this week it said it would bar him from leaving the country and that it had frozen his bank account. 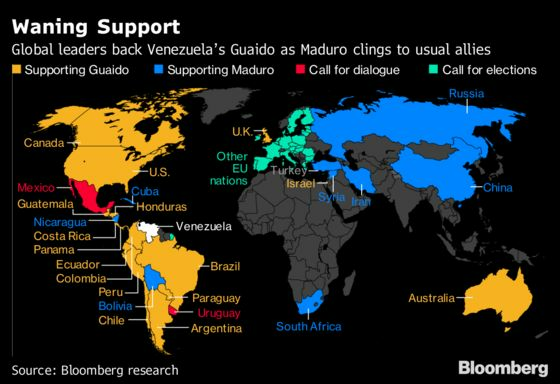 As Guaido has rallied international support to his side, officials from other countries have warned the Maduro regime not to harm him. “There will be serious consequences for those who attempt to subvert democracy and harm Guaido,” U.S. National Security Advisor John Bolton said in a tweet this week. The European Union on Thursday said it would consider sanctions if Venezuela doesn’t move toward new and fair elections. A U.S. official told reporters in a briefing Thursday that whoever in the Maduro regime was responsible for the incident at Guaido’s home could face consequences including exclusion from an amnesty deal, should Maduro agree to step down. The official noted the U.S.’s longstanding military relationship with Colombia but said Guaido hasn’t requested any American assistance beyond humanitarian aid. The official declined to be identified as a condition of participation in the briefing. The U.S. and more than a dozen other nations have recognized Guaido as Venezuela’s legitimate leader and are pressuring Maduro to step down, accusing him of rigging his re-election last year and leading the once-rich country into ruinous poverty. Spain, Germany and France on Jan. 26 pledged to recognize Guaido if elections aren’t called within eight days. Maduro has made offers of talks with the opposition, which has spurned them as a bad-faith offer. Meanwhile, the police unit, known by the Spanish acronym FAES, has been conducting nighttime raids in the barrios to find his supporters. It has been accused of dozens of extrajudicial killings in the past two weeks. After Thursday’s event, the 35-year-old congressmen and dozens of journalists traveled to the east Caracas neighborhood of Santa Fe. Guaido entered his home and reappeared minutes later cradling his child in his arms. The head of Venezuela’s national police denied that FAES had gone to the house. “Totally FALSE,” Police Commander Carlos Alfredo Pérez Ampueda said in a Twitter post. But according to Guaido, four policemen came by truck and a motorcycle to the apartment complex and asked security guards for his family. There were no signs of a break-in. The masked members of FAES, all in black, have been descending on neighborhoods by night to attack demonstrators with weapons including tear gas, firearms and even grenades. They settle long-standing scores and rob residents’ homes, eyewitnesses have said. At least 35 people have died amid demonstrations that began this month after Guaido claimed the presidency. That adds to scores of deaths in two years of unrest.